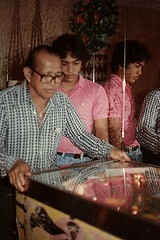 My Great-Grandpa Honorio "Henry" Badajos passed away May 8, 1994 (He was 82). 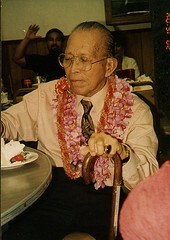 Earlier in 1994 I had an assignment in my Hawaiian Language class to interview one of my kupuna. My kumu, Vance "Hailama" Farden, was giving extra credit if we video taped the interview. Because I needed the extra credit I decided I would video record an interview with my Great-Grandpa, Grandpa Henry. The video was shot on old VHS and I transferred it to digital (via miniDV). The quality of the video isn't that great, and in some spots the tracking is off causing severe white noise (both audio and video). I've supplemented those part with subtitles. My brother Travis was the cameraman and many of the shots were done handheld. I've processed the video to make it less "shaky" which is why the border seems to be "fluid" sometimes. Tomorrow would have been Grandpa's 98th birthday (He was born on December 30, 1912)!